My husband Gabe and I returned home on Sunday morning after spending 8 days in Europe. Over the course of those 8 days, we walked/ran over 80 miles and climbed more monuments than we could have imagined. We had an amazing trip and I can say this was our best vacation so far. The reason for this trip was based around running the inaugural Paris Half Marathon which fell during our second wedding anniversary. 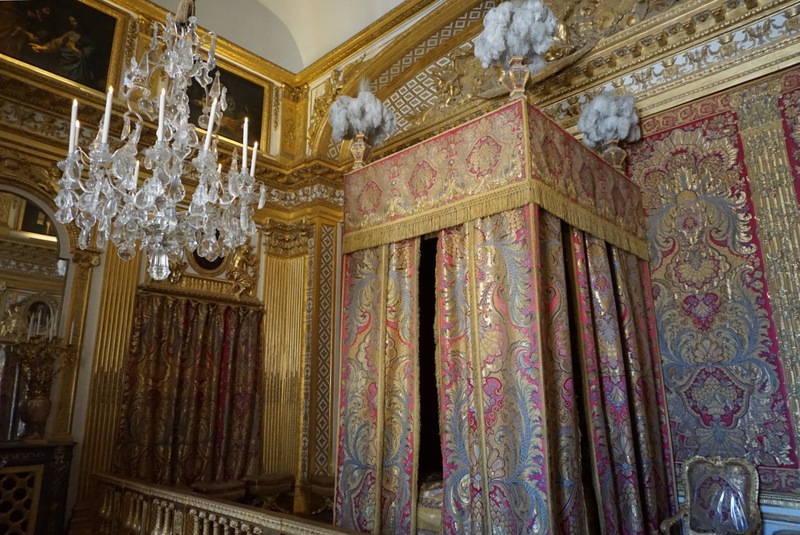 Our itinerary was busy and full of activities which kicked off with a trip to Palace of Versailles! We landed in Paris at 8:30am on Friday and check-in at our hotel was not until 3pm. Since we stayed at Disneyland Paris for the first two nights of our trip, the last thing I wanted to do was go straight there and have nothing to do (we did the parks on Saturday). So we decided to rent a car from the airport, drive to Versailles and drop the car off at the Disneyland Paris train station. It is possible to take the train from Disneyland Paris to Versailles but it takes 2 hours - instead our car ride took 45 minutes. After sitting in Paris traffic (holy cow), we finally arrived at Versailles. It was beyond anything we could have imagined. Pictures do not show how large and beautiful this property is. Although we were both jet lagged, it was the perfect start to our trip. The only downfall was the Apartments of Marie Antoinette were closed for refurbishment. We had a Paris Museum Pass, which allowed us into the property without paying the entrance fee. We were there on a slower day, so the lines were not bad at all. If you use your Paris Museum Pass at Versailles, keep in mind, this does not allow entrance into the Gardens and Park of the Chateau, which you will absolutely want to add onto your visit. We started off Versailles with the Garden visit. It was mind boggling how vast the property was. After walking from garden to garden, we found a cafe and grabbed a snack, I had a glass of wine and Gabe took a cat nap. I was shocked as to how inexpensive the wine was and did not remember this from our last trip to Paris. Luckily for me, that trend continued for the entire trip. More on that later! Although both of us were extremely exhausted, we truly enjoyed touring the Gardens. It was serine and we could have spent hours in there if we weren't on the verge of falling asleep. After walking the gardens and taking what seemed like 1,000 photos, we headed to the palace. It seemed like our jaw kept dropping. 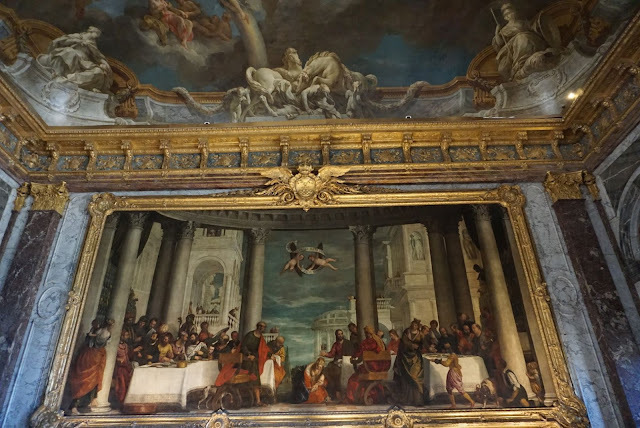 It is not conceivable that this grand palace started off as a humble hunting lodge built by Louis XIII. Versailles Hall of Mirrors was the most spectacular sight in the entire palace. In the 17th century this served daily as a passageway and a waiting and meeting place, frequented by courtiers and the visiting public. Talk about Chandy Candy!!!!! Each of the different apartments and chambers left you amazed and curious as to the life of royalty. The secrets those walls must hold! The art work was stunning, the architecture was unbelievable and the amount of history that this palace holds is fascinating. 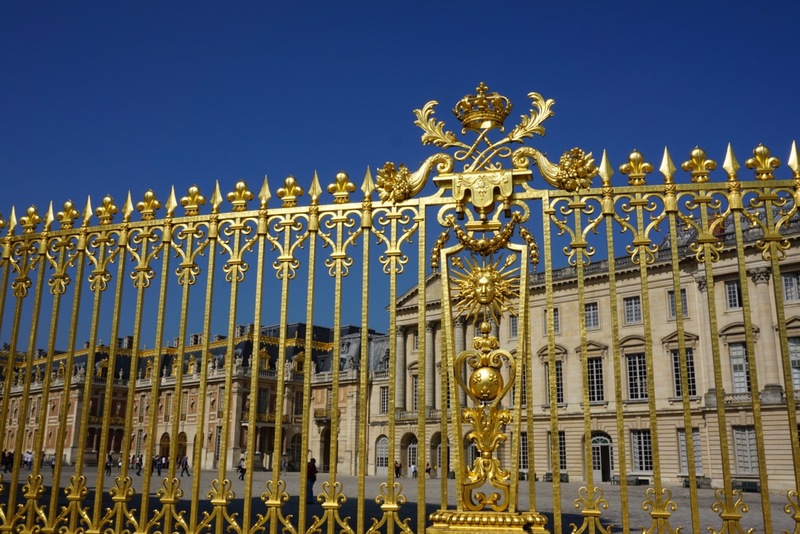 Prior to visiting the palace, we received mixed feedback from friends of ours who had made the visit to Versailles. I must say, we were very pleased to have started our trip off here and glad to have crossed it off our bucket list. If you have a day in limbo like we did, look into renting a car for the day and doing a visit on your own time vs. a tour. I don't think either of us would have lasted on a half day tour and being on our own, with access to leave whenever we wanted was a huge plus. Do I suggest you visiting Versailles? Yes. It is a nice break from the city and if you are coming from Paris, it is only a 50 minute train ride (if you are coming from Disneyland Paris, rent a car from the Marne-la-Vallée-Chessy train station). I received a Paris Museum Pass at no charge to experience Museums and Monuments of my choice. If you plan on visiting a lot of Paris sights, this pass is well worth the price and will allow you to skip lines at many popular locations.